We have a few exciting updates to share with you this week. 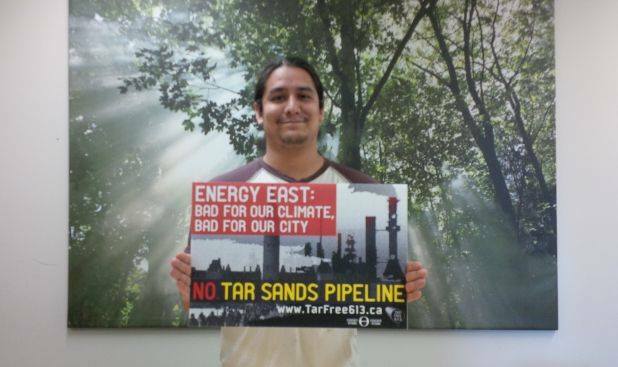 First off, TransCanada came to Ottawa yesterday to promote their Tar Sands pipeline. Ecology Ottawa was joined by the Raging Grannies, who disrupted their event in fine style, sharing some songs. We also helped distribute information to a majority of those who attended (see video below). On Monday, Ontario is asking you the question "What do you think about Energy East?". They'll be in Stittsville from 6:30pm until 9pm to conduct a public consultation into the project. This follows Ontario announcing that they would hold hearings to looks at the risks behind this project. We need to make sure the Ontario government hears our message loud and clear: Ottawa says no tar sands pipeline! If you're free on Monday evening, please consider coming out to voice your opinion. You can RSVP here and receive more information. If you can't make it, there will also be a chance for written comments later. We're very excited to invite you to attend a special event featuring Ecology Ottawa's Executive Director, Graham Saul, Council of Canadians Chairperson, Maude Barlow, and Athabasca Chipewyan First Nation Spokesperson, Eriel Deranger all speaking out against Energy East. 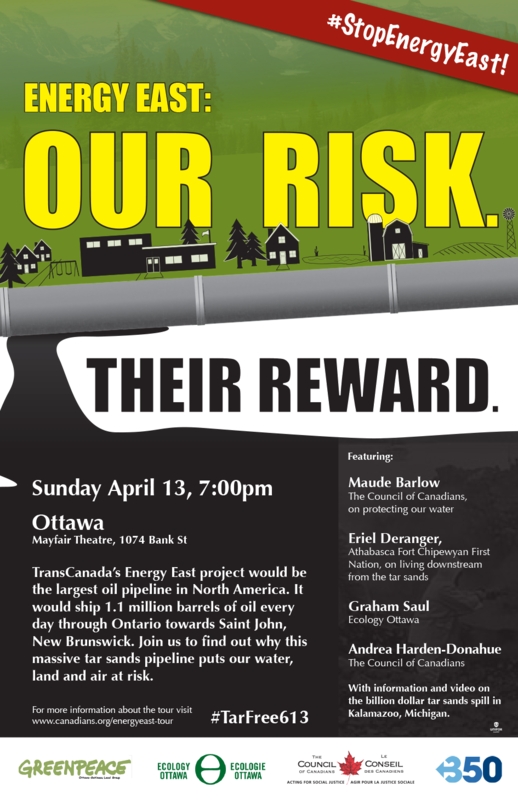 The event is on April 13th, at 7pm, at the Mayfair Theatre. It's free, so please show up on time to ensure a seat. You can RSVP on Facebook or see the event online (and invite your friends!). Thank you Raging Grannies for taking action on climate change in support of your grandchildren's future. Shared this post on Facebook and Twitter.